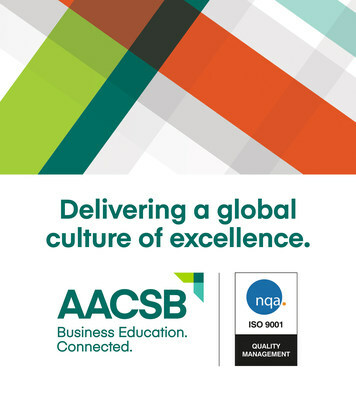 TAMPA, Florida, Feb. 12, 2019 /PRNewswire/ -- In dedication to fostering the highest standards in business education, serving as a connector to the global business community, and developing leaders of tomorrow, AACSB International (AACSB) announced today that its accreditation quality management system has achieved ISO 9001:2015 certification for all of its offices globally. "Earning ISO 9001:2015 recognition demonstrates that AACSB's accreditation division utilizes the same quality improvement processes that millions of businesses have embraced worldwide," said Thomas R. Robinson, president and CEO of AACSB International. "This third-party review process mirrors philosophies of our own accreditation standards, and provides AACSB with an internal framework that ensures an elevated quality experience -- with enhanced customer satisfaction -- for our schools and volunteers globally."